This image made available by NASA in April 2017 shows a still from the short film "Cassini's Grand Finale," with the spacecraft diving between Saturn and the planet's innermost ring. Launched in 1997, Cassini reached Saturn in 2004 and has been exploring it from orbit ever since. Cassini’s fuel tank is almost empty, so NASA has opted for a risky, but science-rich grand finale. I might have been looking at the eye of Hurricane Harvey, but no, I was looking at the surface of Saturn. The pictures were taken by NASA’s spacecraft Cassini as it recently plunged through Saturn’s iconic rings on a suicidal dive toward the heart of the gas giant. Parenthetically, I was also looking at a government program that delivered more than it promised. NASA is a consistent performer, but Cassini could well be their signature success. The pictures I was looking at were taken after Cassini threaded its way through Saturn’s rings and swung over the North Pole of the planet. The huge eye of the hurricane type storm was 1,000 miles wide. That is, the eye (just the eye — not the entire storm) was 1000 miles wide! And the eye was inside a six-sided weather pattern known as the hexagon (a configuration that changes colors with the seasons, even as it travels across Saturn). This hexagon of wild weather has been swirling its high voltage energy above the planet since 2013! These and some 100 other pictures were taken over 24 hours, but they didn’t get back to Earth until Thursday. (Space is deep.) Yet, with all the “ifs” involved, and while using its 13 foot-wide antenna as a shield against rocks and ice particles, Cassini still made contact with NASA’s Deep Space Network at Goldstone Complex in California’s Mojave Desert “right on schedule.” In an era where many programs seem to fall short of their goals, this space craft has exceeded every expectation. 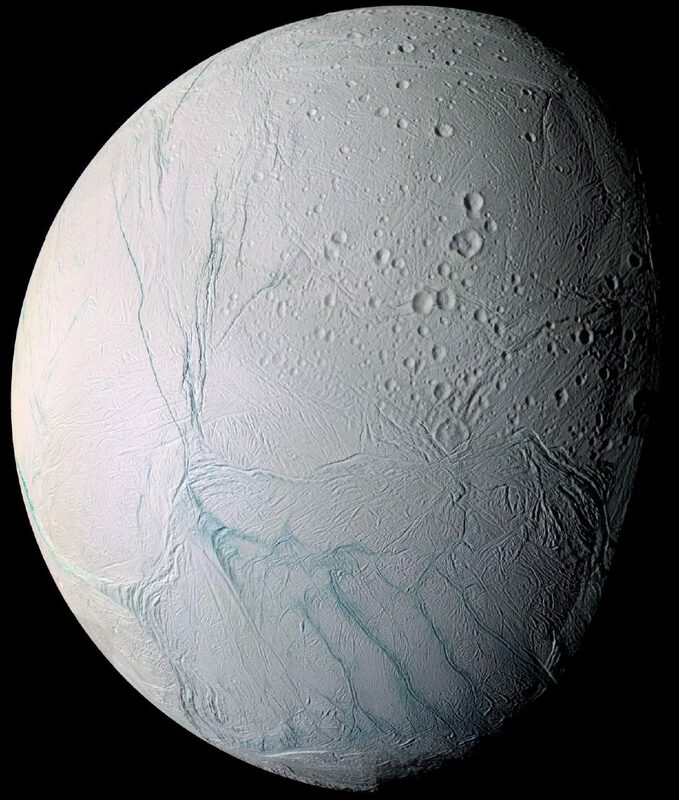 This June 28, 2009 image provided by NASA, taken by the international Cassini spacecraft, shows Enceladus, one of Saturn's moons. NASA's Cassini spacecraft has detected hydrogen molecules in the geysers shooting off the ice-encrusted ocean world, possibly the result of deep-sea chemical reactions between water and rock that could spark microbial life, according to findings announced Thursday in the journal Science. Cassini has been in space for over 20 years. It made its final plunge into Saturn’s atmosphere on September 15, and sent back data the whole way. This was a spacecraft that went down swinging. Cassini has now completed its 13-year mission, circling Saturn and gathering information like a faithful and cooperative servant. When it made its death dive into the planet it continued to transmit precious data for a minute before it disintegrated in heat and high pressure. Right to the end, it did exactly as it was told, planned and programmed to do. It would be easy to anthropomorphize Cassini but we don’t have to; its humanity was carried in its programming, construction and its very inception. It was the mind of man that made this metal live. My husband is the best science teacher I have ever known. He used to tell students and adults that we study the Solar System and the Universe to compare those “neighborhoods” with the neighborhood we already know — our Earth. Those comparisons help us appreciate what we have, but they also help us imagine a reality different from what we know. Cassini is an example of all the best that education, science and technology can provide. Knowledge for the sake of knowledge, but wisdom for the sake of humanity. Every time we remind our schools to spend a little more time, space and mental energy on STEM classes we move this thinking along. Let’s encourage the next generation of scientists.